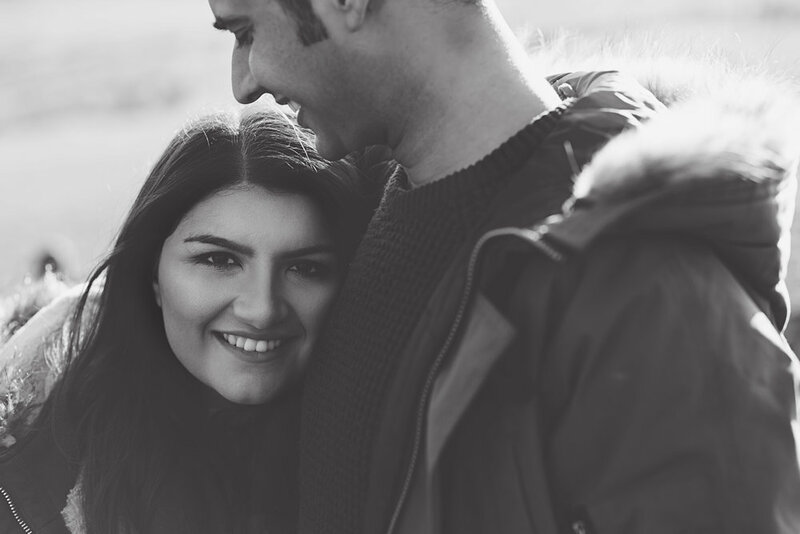 For their actual engagement shoot we went to one of my favourite photography locations, Dovedale in the Peak District. It's only around an hour from Leicester and sports some gorgeous views as well as plenty of secluded locations to get some romantic and intimate photographs. The day started of beautifully with some lovely winter sunshine on the drive up, and by the time we got there it was overcast enough not to worry about distracting shadows. After a quick break for some hot dogs and coffee, we got right to taking photographs. You can see why Dovedale, and the Peak District in general, is one of my favourite places to shoot! Engagement or pre-wedding shoots are as much about getting to know each other as they are about getting great photographs for your wedding stationary or to frame on your wedding day, and the muddiness of Dovedale really lends itself to stepping out of the stresses of daily life and just enjoying some time with your future spouse! Despite already knowing Aamir, this shoot allowed me to see how Aamir and Milli interacted as a couple; by the end of the day they were pro's at posing and completely comfortable with me, and in front of the camera. If all you get out of an engagement shoot is one less thing to worry about on your wedding day then that makes it worth it in its self! Looking forward to shooting their wedding!